A murder takes place. Hong Yi-Young (Kim Se-Jeong), who is a timpanist, does not remember what happened on the day of the murder. She is simple-minded and suffers from insomnia. Hong Yi-Young looks for a job. She happens to meet Jang Yoon (Yeon Woo-Jin). He is bad at singing, but is a pianist in an orchestra. To help with Hong Yi-Young's insomnia, Jang Yoon calls her every night. They try to find the truth about the murder. Meanwhile, Nam Joo-Wan (Song Jae-Rim) is an orchestra conductor. He has charisma and showmanship. Ha Eun-Joo (Park Ji-Yeon) is a violinist in the orchestra. She is arrogant. Takes over KBS2's Monday & Tuesday 22:00 time slot previously occupied by "Perfume." Vei Apr 23 2019 2:49 am Omg ywj, sejeong, and jiyeon are my fav! ❤ but i hope there won't be any love line between the male lead and the female lead. Cz sejeong is too cute for ywj, she just like a kiddo. I think jiyeon will be better for him, cz she is more mature. Nanana Apr 21 2019 9:55 am Finallyyyyyyy! Actor Sejeong! I cant wait! ? 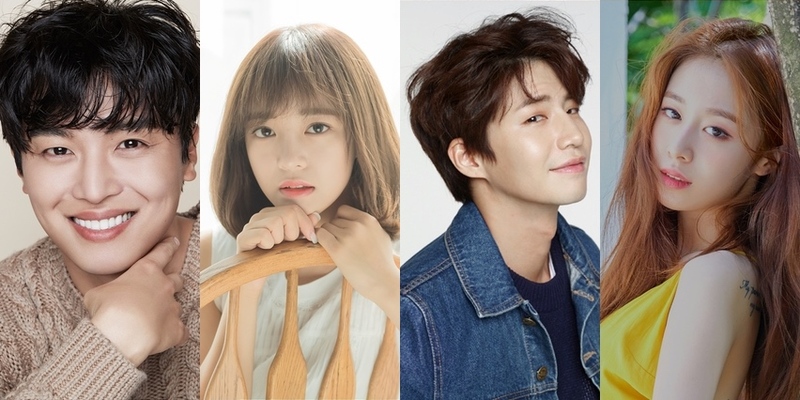 Kayla Apr 20 2019 2:57 pm I’m super glad se jeong got a lead drama, the girl has potentials she was so good in school 2017 and it’s too bad ji yeon is gonna continue playing the arrogant second lead. Hnin Thet Apr 20 2019 1:41 pm Jiyeon! waiting for your comeback drama. Thanks for comeback to us. miss you. Sicnarf Apr 18 2019 6:31 pm Sejeong nooonaaaaa!!!!!!! YeonJoo76 Apr 16 2019 7:57 pm Is that Jiyeon T-ara? She's back to acting?? She look so matured now..I think she don't want to acting anymore but what suprise is this..Long time not see you girl,i thought you will make a solo comeback first....i'm excited for her but i think her fans more excited than me..last time i watch her drama,her acting skill was so great..hope her comeback drama will get more love and attention ,congratulations..
YeonJoo76 Apr 16 2019 7:49 pm Is that Jiyeon T-ara? She look so matured now..She's back to acting? Oh god,i'm already excited.. Her acting skill was so good last time i watch her drama..i think she don't want to acting anymore but what suprise is this..Long time not see you girl.. Hope your comeback will amazing and get more love and attention..Congratulation..
Aja Apr 15 2019 4:00 am I cant wait for your drama comeback Jiyeon???? Variani Apr 13 2019 10:44 pm Looking forward this drama because of my Queen Jiyeon ? Surururu Apr 13 2019 3:12 am OMG! Woojin oppa!!!! Pretty sejeong Apr 13 2019 12:58 am OMG ... sejeong come back in drama...I am so excited.I am eager to see sejeong in drama...l hope I can see it on time....sejeong fighting..
acmxg7 Apr 12 2019 11:59 pm This looks really promising! I can't wait to watch! Yeon Woo Jin is one of my favorite actors and I think this role will fit him very well! Jing? Apr 12 2019 11:26 pm Omg, is Jiyeon really back to acting? A role like dream high2 right I mean not just cameo like in Triangle right?? Oh my god, I'm so excited..long time not see you girl,a talented acting idol..congratulations ?? I will support you and this drama ofc..
JIYEON! Apr 12 2019 10:51 am OMG Jiyeon! So happy that she got a role! SugarSweet Apr 12 2019 2:53 am Excited for Jiyeon ?? Can't wait this July..Hope Jiyeon character is a great person and this drama will have a great storyline too..